Welcome to the blog hop featuring Dreaming Tree SVG Files. I am so excited to be part of this blog hop. Be sure to read through this whole post so you can how to win a Dreaming Tree Gift Card! 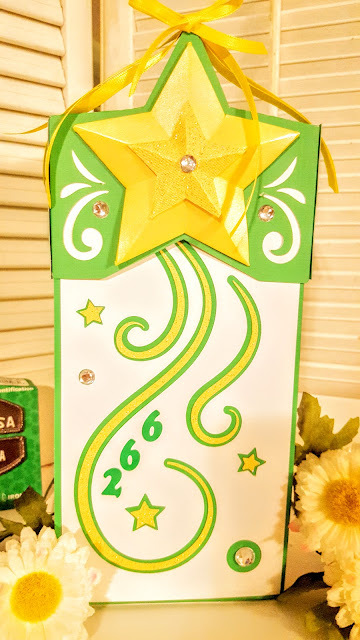 So it's the end of the year for my daughters Girl Scout troop and I wanted to make a little gift for the girls I thought it would be neat to make this box and fill it with goodies for the girls at the end of the year party. 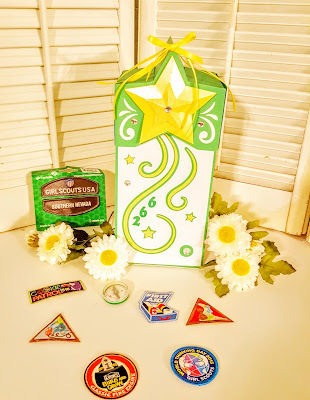 So I made a Girl Scout version of this Dreaming Tree Star Gift Box. Extra entries for Following other steps! Oh so sweet and great box design..
Love the colour scheme. :) Another project I need to try out! This is one of my favorite designs, love the way you changed the colors. Love what you did for the girls! They will love this. Great job! Great project! Changing the color scheme sure gives it a different look! Great idea! I love the colors you used! Love your star boxes, they are awesome. Love the boxes and the colors. Very pretty!!! Love how different it looks with just the papers you chose. Such a cute project. I love the papers you chose. Great job!! thanks for sharing - great for Christmas (which is not far away!!). love it. Such bright colors-makes for a cute project. I'm sure they loved it! Love it could be used for the 4th great idea. Great idea and it makes such a nice big box to fill with goodies!!! Great job! What a great idea! Thanks so much for sharing and for the chance to win! Love your twist on the star box. Love the bright colors! I love making gift boxes! Cute! Great job, Monique. I really love the colors you used. I am sure the girls will love them! This is such a wonderful idea! I will be making this one! Love your idea! I love the creativity that you have! Wonderful idea and super work!! Love it. What an adorable adaptation to this sweet box!! I bet your little ladies will just love it! Great idea, I love this for my daughters troop. I LOVE your version of the Star Box!!! So much fun to see all the varieties of projects. Thanks for sharing. I just think this is fab! Can be used for so many occasions! Fantastic work! Very cute!!! Love the colors & the way you adapted it to what you wanted it for. What a wonderful idea! I do so admire you the way you think outside the box! I bet the girls were thrilled! I bet the girls loved it. Love the idea, thanks for the inspiration to look at the cut files in a different way than their original intent. You have wonderful and beautiful things to share with us and I'm really glad to see them. Such a fabulous gift for the troop & a great way to make sometime totally unique for your needs. Color really changes this card. I wouldn't have thought to put just those colors together, but love it. Great job. I love this and will be trying this next! That is very cool. You can change it up so many different ways. Really cute. Love the "happy" bright colors. Lucky scouts!!! Wonderful gift for girl scouts. I'd like one filled with thin mints - lol. Fantastic project idea. Green & yellow where my high school colors. The girl scouts will love it. Thank you for sharing. Thanks everyone. Goodluck to all! OMG! Love the colors you used!!! Turned out fab ! Not sure why the contest ended early, but your box looks great! I'm sure the girl scouts will love them!